Folds Down for Easy Storage! Grab Gopher It is the pick up and reaching tool that makes reaching for things up high or down low super easy! Grab Gopher It is the pick up and reaching tool that makes reaching for things up high or down low super easy! 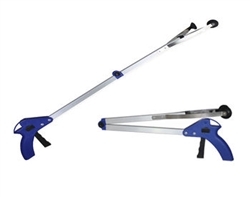 Featuring an extendable and rotating arm that allows the user to get reach hard to get items without bending, climbing, or straining. This grabber tool includes a comfortable handle with large trigger to activate the two suction-cupped gripping "fingers" when squeezed. Gopher It Tool is the reacher grabber must have for any household. This pick up tool also folds down easily for storage.